The fast approaching future of virtual reality is set to place everything from gaming to movies to shopping in an immersive VR landscape. Right now that means strapping on a bulky headset, which plenty of people aren't up for doing. Seeing this, Panoworks has come up with a projection alternative. 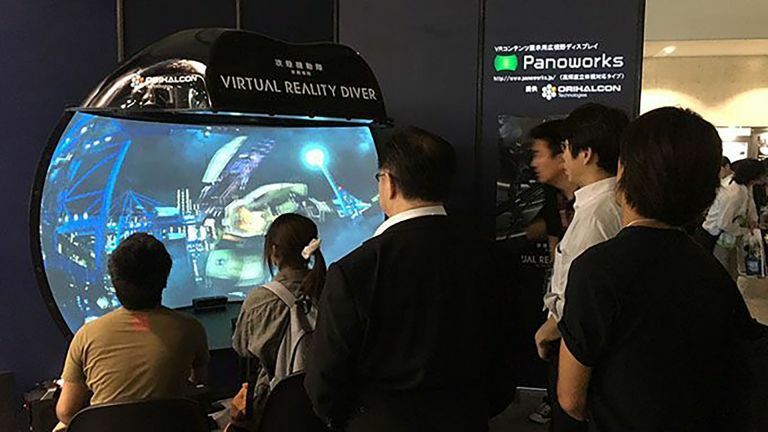 Panoworks pairs a panoramic curved screen with a HD laser projector to translate VR onto the screen. The result is a 150-degree field of view which can transpose 360-degree YouTube videos, games and more onto a wall which anyone can view, minus a headset. Obviously this means you won't be able to turn your head to look around in the virtual world. Instead the imagery can be manipulated using a trackball, touchscreen or rotator. There will also be support for hand gesture controls when hooked up to a Leap Motion or Microsoft Kinect. The video output can be upgraded, by using different projectors, to top out at 4K resolution with 5.1 stereo surround and stereoscopic 3D. It'll even work as a giant TV or monitor if that's what you want it for. As more and more video and gaming content is made for VR, which can't easily be viewed on a normal screen, this idea makes a lot of sense. Being able to watch virtual reality content with others, minus the anitsocial headsets, is a really nice option. At the time of writing the Panoworks pricing has not been announced and it will initially only be available in Japan. Here's hoping it's cheaper than a VR headset and reaches the rest of the world soon. T3 Awards 2016: who's nominated for Gadget of the Year?